Looking for illegal “bugs,” the FBI uses a cadre of specially trained agents who employ Technical Surveillance CounterMeasures [TSCM] to locate and identify concealed electronic devices designed to intercept/record electronic signals containing data, video and voice communications belonging to the Government and/or private industry. The signals being transmitted/intercepted are radio waves traveling through the air. Besides foreign agents who use “bugs” to conduct espionage and/or spy on Government facilities to steal information, criminals and thieves also use “bugs” looking to steal intellectual property and secret processes, and on occasion a jilted lover … trying to rekindle an old romance and/or exact some type of revenge. Law enforcement and U.S Intelligence agencies can use electronic devices to intercept, capture and record electronic signals, but only if they comply with the provisions of the Electronic Communications Privacy Act [ECPA] and the Foreign Intelligence Surveillance Act [FISA] authorizing electronic surveillance. Conducting an investigation in the United States, unless authorized by the Attorney General [AG] and approved by a Federal District Court Judge, using a “bug” to collect evidence, intercepting/monitoring/recording a conversation, is a criminal offense warranting federal investigation and possible prosecution. Seeking to conduct electronic surveillance conducting a criminal investigation, originating law enforcement agencies must submit an affidavit supporting their investigation to the Justice Department for review and then later a District Court for approval—detailing an investigation and justifying the surveillance. Concerned about security, the FBI also uses Technical Surveillance CounterMeasures [TSCM] to detect hazards and security weaknesses. To comply with security mandates, FBI offices are required to conduct TSCM surveys using Technical Surveillance CounterMeasures [TSCM] so managers can make year-end certifications, requiring thorough examinations employing special technology and equipment that includes visual inspections and hands-on physical searches. Employing Technical Surveillance CounterMeasures [TSCM], agents generally look for “unexplained” radio waves emanating from a facility or being directed to a facility using a Radio Frequency [RF] receiver. Only quality lab and field RF receivers should be used conducting the TSCM surveys which are expensive to purchase, requiring a working knowledge of RF theory to operate. Because the sophisticated equipment is expensive, establishing a security business conducting Technical Surveillance CounterMeasures [TSCM], retired agents will group together so they can share the equipment, doing business as limited partners. Included among the pieces of technical equipment used by agents conducting Technical Surveillance CounterMeasures [TSCM] are: 1.] Multimeters to measure power supply and device components; 2.] Time-Domain Reflectors [TDRs] to test the integrity of copper telephone lines and other communication cables; 3.] Frequency Scanners with antennas and filters used for checking the electromagnetic spectrum for “unexplained” signals; 4.] Oscilloscopes for visualizing signals; 5.] 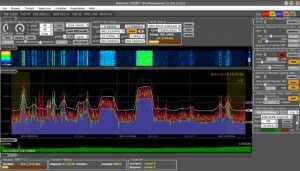 Spectrum Analyzers and Vector Signal Analyzers for more advanced analysis of threatening and non-threatening RF signals; 6.] Nonlinear Junction Detectors [NLJDs] for detecting components associated with hidden eavesdropping devices; 7.] Portable X-Ray machines for checking devices that might be hidden inside objects and walls; 8.] Computer Security Devices & Tools for computer related threats; 8.] Tools for disassembling objects and walls looking for illegal devices; and 9.] Thermal Imaging Devices to assist identifying concealed “active” devices. Directory members can be extremely helpful to anyone seeking information and/or requiring a professional opinion concerning Technical Surveillance CounterMeasures [TSCM]. Accordingly, looking for an expert concerning Technical Surveillance CounterMeasures [TSCM] just use the website’s search feature to locate someone, entering the appropriate skill, issue, or need as well as the geographical area of preference, and thereafter make contact using the information provided. Retired FBI Agents and Analysts with a background in Technical Surveillance CounterMeasures [TSCM] interested in securing a Directory listing and/or a personal email address need only to submit an online application requesting membership to join the organization.